Because we try to mix pleasures with business in our Romanian vacation, a few days after our arrival, all ROSI members that was in the aria (to be read; from Brasov) met for a beer. From left to right: Adi, Lusu, Stefan, Lau, Cipri and me (missing from the picture because I was shooting it :). Sorina – Laurentiu’s wife and Stefania – my wife join us.We spent a great time, chatting, knowing each other better and discussing about Liberatica.A single conclusion: all of us are eager to start the preparation! Well Zak, as – I mentioned on your blog – even if you weren’t in person with us, be sure you where present in all our discussions. 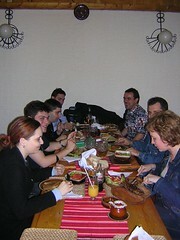 Hi Bogomil!Would be great to have you like a guest next time! Zak told me about you!I would welcome to keep in touch with you; actually your experience is a great resource of inspiration for us in setting up Romanian Open Source and Free Software Initiative. And never knows, maybe Yovko’s dream to have together an OS/FS common conference in Balkans will became true.Good luck with WebTech 2006!